Our rotor die casting machine is easy to operate. It only takes one day for green hands becoming practician. it takes about 10min to change mould. It has a high working efficiency, 10-12s/pcs, 300-400pcs/hour. Unlike the conventional die casting machine, our machine doesn't need asbestine cup to keep the temperature and demould. 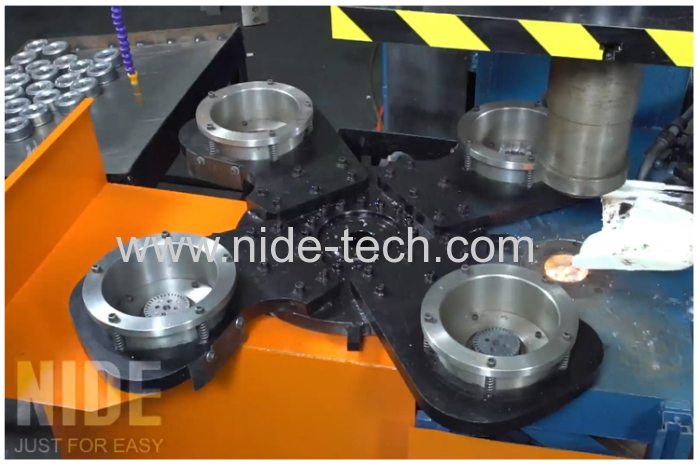 operator only need to press "start" button, no need to handling the heavy tooling which might occur body injury, and the machine has aluminium anti spatter design to prevent the aluminium liquid from spraying and cause injury. 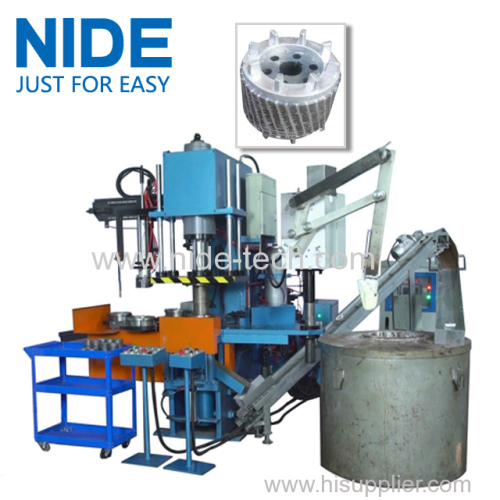 This armature die casting machine is consisted of main machine and hydraulic electronic control system . Automatic get aluminium melt liquid, automatic loading and unloading the rotor. Rotor loading: automatic pneumatic circularly pick up. Get aluminium melting liquid: servo motor control the mechanical arm, control the liquid volume through human-machine interface. Automatic cut the waste material, automatic recycle the cut wasted material and convey it to the furnace by the conveyor. Automatic feed mold releasing agent, the feeding time and times can be set. There is water cooling channel, helpful for reducing the mold temperature effectively. Setting on touch screen: forward and backward speed, stroke, swing angle of the mechanical arm, loading speed,etc. Machine will alarm and stop working if out of material. Failure will be automatic displayed and machine will alarm. One person can take care of more than one machine.